Vuforia 6 introduced support for the development of Universal Windows Platform (UWP) apps for select Intel based Windows 10 devices, including Microsoft Surface and HoloLens. 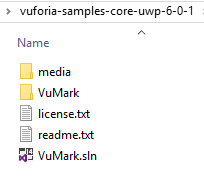 A version of the Vuforia Engine is available for both native and Unity UWP development as well as UWP sample projects demonstrating the use of VuMark and ImageTargets in both C++ and C# for Unity. The Engine SDK and samples both utilize the Vuforia C++ API for UWP native development and the C# APIs for Unity development. Note: Vuforia supports x86 UWP builds only. ARM UWP builds are not supported. You’ll need to install the above versions of Visual Studio and Unity and then configure Unity to use Visual Studio as the preferred IDE and compiler. You’ll also need to install Visual Studios tools for Unity, see the article below for a link to this installer. When installing Unity, be sure to install the Universal Windows Platform, and also the .Net Scripting Backend. Universal Windows Platform components can also be installed afterwards, from the Build Settings dialog when the Universal Windows Platform is selected. Start with one of the Vuforia HoloLens Samples to understand the structure and organization of a Vuforia Windows 10 Unity project. The samples are complete Unity projects that include a pre-configured scene(s) that implements Image Targets, or VuMarks. You can easily build these to evaluate each feature, by selecting Universal Windows Platform as the target platform and then pressing the Build button in Build Settings. See Building and executing the sample below. When you build a Universal Windows Platform app, Unity generates a Visual Studio project and launches the Visual Studio IDE. You can then build and run the project from Visual Studio. 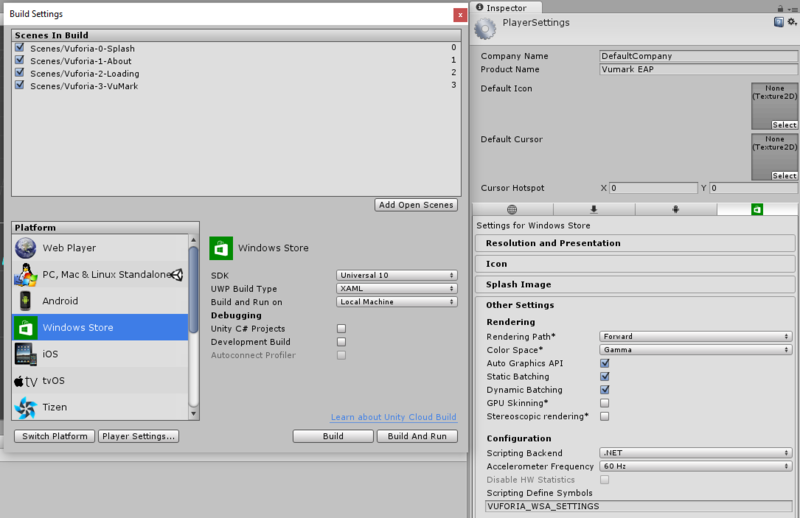 To build the sample, add all of the scenes in the /Scenes folder to Scenes In Build in the File > Build Settings dialog. Select Universal Windows Platform as the Build Platform. Note: You may need to install additional Unity Universal Windows Platform components if you had not selected to install these when you had originally installed the Unity Editor – the dialog will direct you to the necessary installer. Selecting Build for Universal Windows Platform will generate a native project directory and solution for those platforms. You will then need to build an executable from these resources Visual Studio. ⦁ Set your platform build target for Universal Windows Platform in File > Build Settings. ⦁ Add your scene(s) to Scenes in Build. ⦁ Define a unique Product Name to serve as the name of the app when installed on a device. Be sure to set your build target for x86. This article will guide you through the steps for setting up the Vuforia UWP SDK and ImageTargets sample in Visual Studio 2015. Note: this image shows the VuMark.sln from the VuMark sample, an ImageTarget.sln is provided w/ the ImageTarget Sample. ⦁ You can now build and run the sample. 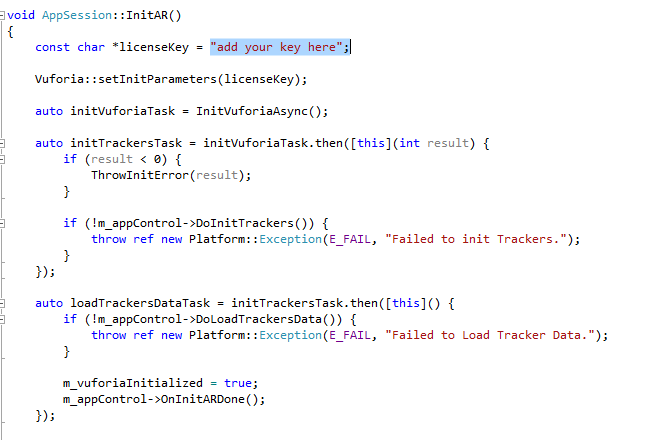 Note: If Visual Studio does not recognize the include path for the sample project, you’ll need to add it via the Properties dialog for the ImageTarget project by right clicking the project name in the project inspector. Add the Vuforia folder to the include path. Be sure to set your build target for x86, note that 64bit builds are not supported. The State object contains references to all current TrackableResults. You can obtain if from the Vuforia Renderer instance, as shown in the Render() method in ImageTargetRenderer.cpp. // Renders one frame using the vertex and pixel shaders. // Vuforia initialization and data loading is asynchronous. // Only starts rendering after Vuforia init/loading is complete. Once you have the State object, you can query the state of each TrackableResult to access its pose, determine its type, and obtain a reference to its associated Trackable instance. The pose obtained from this result can then be used to render content onto the ImageTarget in the camera view. // Prepare the constant buffer to send it to the graphics device. // Each vertex is one instance of the TexturedVertex struct. DXGI_FORMAT_R16_UINT, // Each index is one 16-bit unsigned integer (short). // Attach our vertex shader. // Send the constant buffer to the graphics device. // Attach our pixel shader.